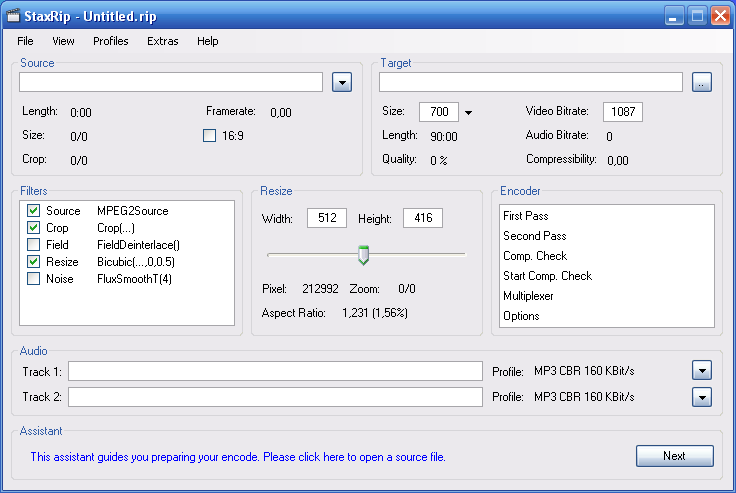 With StaxRip you can easily convert your DVD's, DVB captures and many more formats into MPEG-4 like DivX, XviD and x264. As a open source application StaxRip is completely free. No spyware, adware or any other form of malware. No registry bloat, settings are saved in files within the application's directory or within the user directory. No lost settings after a fresh windows installation. No awkward setup/installer, no system changes, system bloat and trash. Easy to use and highly versatile and customizable. Reasonable default values for filters, codecs etc. Rich help system including, online help (assistant), context sensitive help and forum support. Rich and convenient cutting facilities e.g. to remove ads. Rich feature set to manage, integrate and download required third party application transparently instead of awkward or dangerous codec packs or application packs. AviSynth powered to achieve excelent video quality and support of almost any source format. Reportet bugs get fixed quickly, often a new version is available on the same day! Many feature requests get incorporated very quickly. Updated eac3to, fdkaac & qaac. Both FFMPEG and MPV now use custom Builds instead of the normal default build(Which Fully Supports VapourSynth). Added Limited Support for VS in MPV(Requires VSPipe). FFMPEG, x264, x265 & MPV are now compiled Using GCC ToolChain instead of MVS. Python Search Path has been Updated to 3.7/3.7.1 & Python 3.6 has been Removed. Also Included Support for Anaconda3. The VapourSynth Script has been slightly altered to work better with Python Search Path. VS has been Updated to R45. Updated the Update Script to Support additional HTML Protocols, due to the changes on the website. Added hnwvsfunc for VS & mClean to Context Menu. Cleaned up the AVS Filter Names. Modified the Profile List for x265, Only Profiles that work with Current Selected Depth with Display. Removed any 8Bit x265 that no Longer used with 2.9(Based on: https://x265.readthedocs.io). Moved Some Extra Functions to the System Process. Fixed any Issues for very Short filenames being converted to wrong type. Removed MediaInfo 18.08.1 Due to Bugs it contains and Re-Added MediaInfo 18.05. Added More Support for HDR to Intel Encoder. VS Filters Added: W3FDIF, MiniDeen, IT, TDeintMod, vcfreq, vcmove & TemporalMedian. Updated mvtools-sf to AVX, The latest Builds only use AVX2 which not all CPU's Support. Added Support for RawSourcePlus for Avisynth and RawSource for VapourSynth. Default Pixel_type is set to YUV420P10 (aka P010). Dual Package Setup for x264 have been Removed for Single release x264(8+10Bit). The Depth menu will set the Output Bits, exactly like x265. ColorMatrix: Added chroma-derived-nc, chroma-derived-c, and ICtCp. vbv-init has been modded to have a locked value and proper float point scaling. FFTW Files will auto copy to System Directory, if your PC is missing these files in the System32 Folder(Fresh Install). MP4Box is back to Static Once again. Included Setup files for Python 3.7.1 & VS R45 to make sure the proper versions are being installed for StaxRip.